We all wish Mick a big happy birthday! 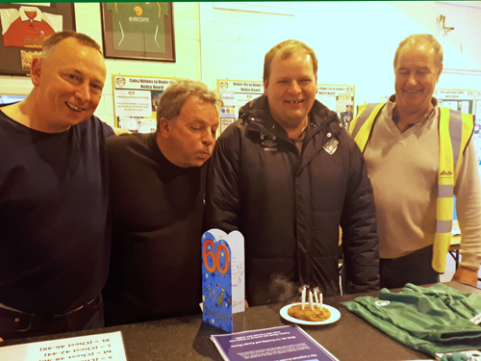 There were big celebrations in the clubhouse this morning as our esteemed manager and colleague, Mick Smith, marked his 60th birthday before taking his DDSL U-16Bs out to Pitch 1 to take on Marks Celtic FC at 12.30pm. Mick has been managing with the club for all of the 21st century and has taken a number of groups and many players, each of whom really enjoyed their time with him, through the ages during that time. Pictured are (l to r): Tony Livingston, Mick, his son Paul and Gay Kinnear. Best wishes to Mick on his birthday and here’s to many more!